Welcome to yet another Top 7 list. I've once again decided to cover both the best and worst of a specific topic...so this has become a twin Top 7 list. I've been wanting to do this list for quite some time and really didn't get motivated until I uploaded my review of the Ranger Item Set from Ohranger. Both of these lists were kinda difficult to assemble. The main problem I ran into was that I either love or hate big finishers in Sentai. There is rarely an in between where my only reaction is "meh". Honestly, the only thing that I really look for in a finisher is effort. You can tell when there some love put into making a finisher awesome. There are other times when finishers are used out of sheer laziness. We also get some instances where it was just a swing and a miss. I'm not limiting myself to weapons, but they'll probably pop up the most on this list since they're usually the most memorable finishing attacks. How can you go wrong when five fighters combine to become a giant flaming bowling ball? It might not be the most creative thing ever, but it sure is damn cool looking every time they do it. It always results in a massive explosion. 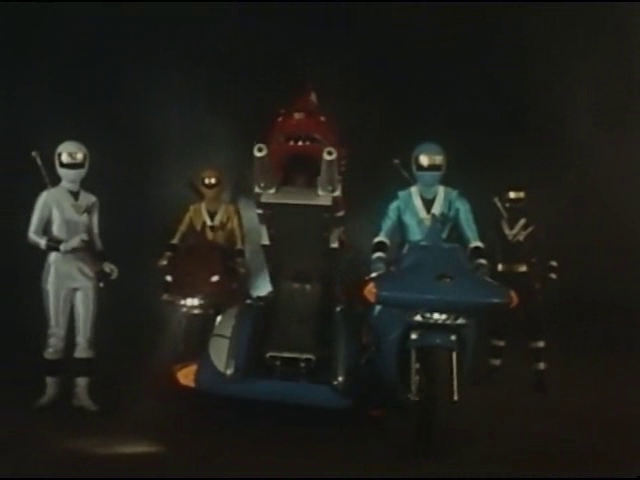 Outside of over-the-top team poses, the Rolling Vulcan has to be one of the most identifying things in Super Sentai. Have you ever seen this short film? There are many other big cannons in Super Sentai, but the size and design of this one make it stand out on it's own. The colorful beam doesn't hurt either. Not only was the design of the Power Bazooka slick, but so was the sequence. I always felt they were trying to one up the Power Bazooka with the Rolling Vulcan but weren't quite able to do so. The Power Bazooka is just cooler. Maybe the Bimotion Buster is slow to summon, but the sequence is well worth it. In fact, this one makes the list almost entirely for the sequence. The design is cool, but the over-the-top summoning of this thing really seals the deal. Getting back to the design...I like how it kinda has the pumping motion. It gives it a little more zing. I like the Zyuranger's Legendary Weapons. They especially look cool when they're all together as the Howling Cannon. It might have the longest sequence in history (nah, not really...pretty much any ball-related attack goes on for an extended period of time) but it is totally worth it. It also really helps that four out of five of the weapons have firing capabilities...even the Tricera Lance and Saber Daggers. I guess there was no real way to give the Ryugekiken some firepower. Back when Go-onger was airing I was becoming serious about current Super Sentai toys once again. I feel like if this had happened in the years prior or years after Go-onger...things would've been a little different. Go-onger itself is a show I didn't much care for, but I do have a certain fondness for the designs--their arsenal in particular. The Highway Buster is truly one of the coolest Super Sentai designs of the last ten years. I mean...Go-on Yellow's weapon is a car-shaped bullet. How cool is that? Maybe the actual attack with this one is a little lackluster, but the Giga Formula itself is fantastic. Five really cool weapons that combine together to either become a car or a giant cannon. Awesome. It even came with it's own instruction manual. 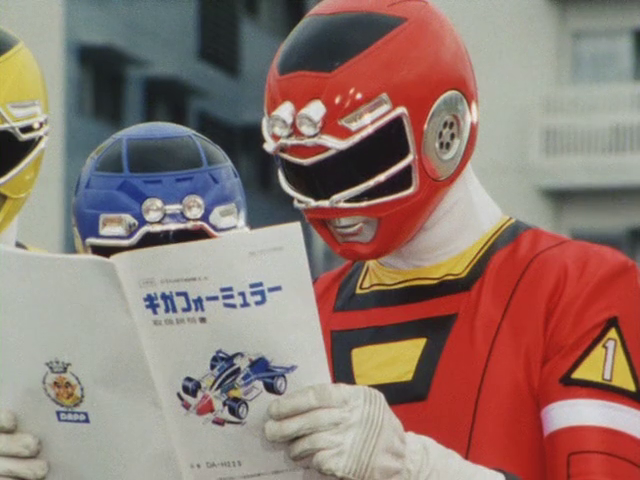 Ever notice how Red Racer pulls the plastic off the manual and just tosses it to the ground? Then Blue Racer stealthily picks up the plastic in the background. Anyway, yeah...Formula is an awesome weapon. Obviously. What else could be number one? This one takes the concept of big finisher to a whole new level. Not only was this taking the big finisher to a whole new level, but it was taking attack motorbikes to a whole new level. This is basically giant cannon+Road Sector from Kamen Rider BLACK. It's a shame they didn't use it more often. I like the effort on this one...but I think they were a little bit too ambitious to the point where it became awkward. There is even some weird animation thrown into this one. The Goggle Victory Flash was a safe/lazy attack...but the Golden Spear was definitely something done at great effort that kinda turned out really weird. I generally enjoy ball attacks since they inexplicably use an American football and are usually convoluted to the point where they become great in their wackiness. The Super Fiveball is none of that. It's a round ball for starters. It doesn't really do anything exciting or interesting. It's just a ball they punch and kick around. If it at least looked as cool as the Kakuranger Ball that's be one thing. Oh c'mon! One year after the awesome Super Dynamite and we get the Biomic Hug??? PASS! I like Gogo Five quite a bit. The one big failing the show had was with it's designs. The two things I liked were the Gogo Brace and Victory Robo. I'm not a big fan of anything else. The Life Bird in particular is a lame-looking set of weapons that leech onto the handle of the Five Laser. Some people seem to like this one for some reason, but I legitimately can't stand it. It's a massive sword that shoots discs in a flurry of bad CG. I really like the design of the Shinkenmaru, but everything beyond that looks stupid. Every time I look at this thing it just screams "I'm a hollow hunk of plastic". If it were the least bit believable as a weapon, that'd be one thing. This thing is cartoonish in a way that I'm surprised MOTW didn't laugh at him whenever he pulled it out. Holy crap this is an awful design. You can even tell that they knew it was a terrible thing when they replaced it with the plain looking Jet Cannon. It feels like they were even trying to erase this thing from existence by going back and re-recording the lyrics to the Shot Bomber theme song. That's right...they got Hironobu Kageyama back into the studio to replace "Fire! Shot Bomber!" with "Fire! Jet Cannon!" in Shot Bomber's own theme song. Jet Cannon: The much safer design. More like Shi.....you get the picture. It's always Magiranger. Always. Without fail. I'm really not exaggerating, either. It feels like every Magiranger finishing attack involved a spell, some obnoxious color saturation, and a horrible CG sequence. Even the Magibolt with the Dialrods was garbage. Doing formations with sticks was the fashion in Battle Fever J and Denjiman, but this was 2005. Unacceptable. Magiranger effects are the poop you get after sprinkling a teaspoon of glitter in every meal you eat. Who approved this abomination? Yet another set of Top 7 lists for the books. If you want to check out other Top 7 lists, I compiled a list of them all on one convenient page. Give them a read and tell me how wrong my own opinions are on my own blog. There are only two more blogs left for 2015. I will return in December with one more CD Collection post and end the year out with a Top 7 Best of 2015. Stay tuned for both! Thanks for reading and see you in December! Interesting selection for Top 7 Best. Nice choice for Honorable Mention, where it’s the only one that’s not weapon. I got to say, that attack was pretty neat. I like how #7~#5 are from the 80s. Rolling Vulcan may be the most intense and deadliest looking cannon I’ve seen. Power Bazooka is probably my favorite among combined bazooka; it was awesome enough to be on cover of music collection. That alone makes it awesome. While I’m not a fan of Triple Bazooka, Bimotion Buster is quite a nice looking weapon, even if it’s bit bland of design. I had a feeling that this weapon would be in the list, since you made tons of video of Zyuranger toys. It’s probably one of the most iconic combined weapons of the 90’s, especially with popularity of Power Rangers. It looks great in show, as well as Figuart. Interesting choice for #2 and #3, where they are both car themed show. It’s interesting how Go-onger frequently gets on Top 7 lists (sentai mecha themes, suit designs, henshin items, etc. ), despite how you don’t care about the show. While I’m not a huge fan of series as well (I do have guilty pleasure however… lol), I do like design and aesthetics of suits, mecha (individuals, not combined), and changers (except Go-Phone which is too bland); the major problems was writing and acting. As for weapon, I do admit that it’s very unique and cool looking; arguable one of the best combined weapons of 00’s. I like Giga Booster, but I preferred Giga Formula, where it has more color and better style. 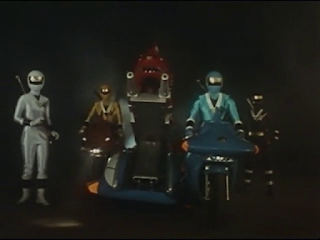 I thought it was going to be Kakuranger Ball, but I didn’t expect bike to be on list. I think its bit unfair, since it’s so different (not cannon and/or combined weapon), but I can see where you’re coming from. Such a shame it was only used 3 times in show (and movie), since it was pretty unique attack. As for worst, another nice selection. Interesting how 3/7 are from 00’s which is not really a surprise, since majority of finisher in this era are unimpressive IMO. Goggle Five gets to be on worst yet again. To be honest, that show was kind of bland and least impressive among 80’s, so it’s no surprise that finisher is bland and generic as well. Who’s dumb idea was to make AIBO-looking robot turning into cannon was such a good idea? I lol’d at Super FiveBORE. Pretty much sums up the entire show. How uncreative indeed. A HUG as finisher for Bioman… really? How did that get greenlit? Even as 80’s it was lame idea. I was expecting something like that for Magiranger. As much as I liked GoGo Five, the design was bit of letdown. It’s kind of opposite as Go-onger, where it had good design, but series wasn’t very good. I give credit for originality, but execution felt short. 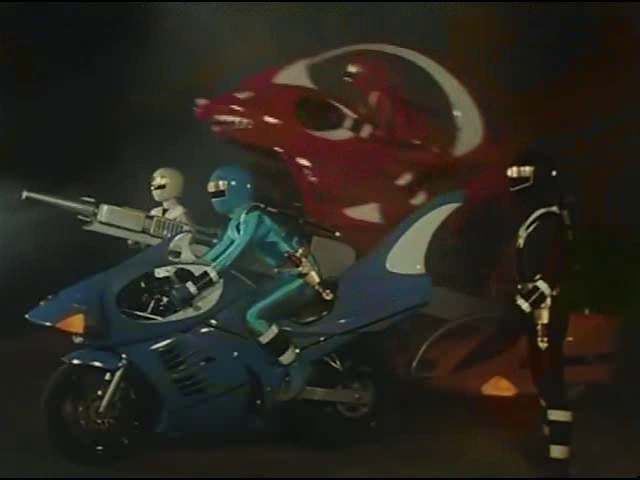 Looks like something that could’ve used for Jetman. Nice to know that I wasn’t the only person who couldn’t stand Rekka Daizanto. That sword is too massive and cumbersome, that it’s really hard to take it seriously in action, for serious show. At least it wasn’t a changer. It looks silly on Figuart as well. As much as I like Maskman, the Shot Bomber looks hideous. Red wearing that stupid pack makes it sillier and really hard to take it seriously. It looks like it was made from spare parts and scraps of mecha. Jet Cannon was definitely an improvement. I wouldn't say that Goggle Five's golden spear finisher is bland. It's just bizarre. I can't think of too many instances prior to CG where a Sentai series featured actual hand-drawn animations. It's impressive in how over-the-top it is...but man does it miss the mark. I’ve mentioned in your review of this weapon, that I tend to prefer combined weapon over single and this is no exception. I like how there’s 7 weapons in this combination, which is pretty unique. Even the name sounds pretty cool. I like the design of Jugekibo, where it’s both rod AND bazooka, which is pretty unique. It’s also refreshing to see a non-combined weapon (bazooka) finisher. Didn’t care too much about the upgrade that came out later, where it looks silly. Timeranger is one of my favorite series of the 00’s and I really like their weapons as well. It’s been a while since we had individual bazooka to combine in one big bazooka. Probably the one of the best looking bazooka of 00’s. Colorful, yet deadliest looking bazooka I’ve seen. You don’t want to mess with Flashman. Favorite combined bazooka of the series. It was cool enough to be on cover of CD, which makes it awesome. Win-Win. While I’m not a huge fan of the series or sword as finisher, this was a pretty unique combination weapon. It’s not often you see combined weapons to form sword. I like the finishing call “邪鬼退散”, which is pretty unique. The weapon screams “WILD”!! What’s not to like? I really like it Zyuranger and Power Rangers. Great design and combination. It looks awesome on Figuart as well. Since you picked bike, I chose ball. Among the “ball” attack, this is my favorite. What’s even cool is that Jusho Fighter gets to use it as Super Kakuranger Ball. It was very interesting to see mecha to use ball attack. 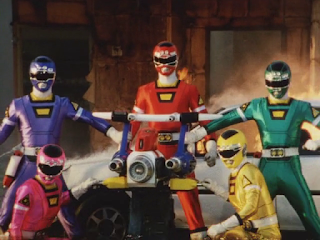 It’s also nice that Ninjaman get to join the attack later, since it’s rare to see additional ranger to join finisher. Not too much to say about worst, since you pretty much summed up. I really can't think of it on top of my head, but there are two finishers in recent years that bugged me. Not only I’m not a fan of the series, I didn’t care about the finisher. The weapons that use cards sound nice on paper (no pun intended), but execution was very lackluster. It looks very cheap, especially with Gosei Cards that magically turn big when you insert on weapons. While GaburiCarnival (Gaburivolver + Gabutyra de Carnival) isn’t terrible combination weapon per-se (it still look awkward), the main finisher is the big problem. Not only I HATE the show , but it also has that annoying Shigeru Chiba voice that you get to hear EVERY where. Ugh. I also hate Kyoryu Red Carnival (which is required to perform finisher); it may be the worst power-up mode I’ve seen in sentai. It’s so disgustingly hideous. I give credit for being the only finisher to have 7~10 rangers combination, which is kind of impressive (sort of).